It may seem off topic to write about September 11th what with Israel’s withdrawal from the peace talks yesterday. Though the statement Israel released is nuanced. As I read it, Israel wants to say no – and wait – to see how the Palestinian unity pact works out. Or doesn’t. Meanwhile settlement building and other provocative measures will continue. Of course. But our interconnected world has other Middle Eastern realities closer to home. Yesterday a flap surfaced over a video to accompany the National September 11 Memorial Museum in New York City set to open in May. I haven’t seen the video – it hasn’t been released yet. 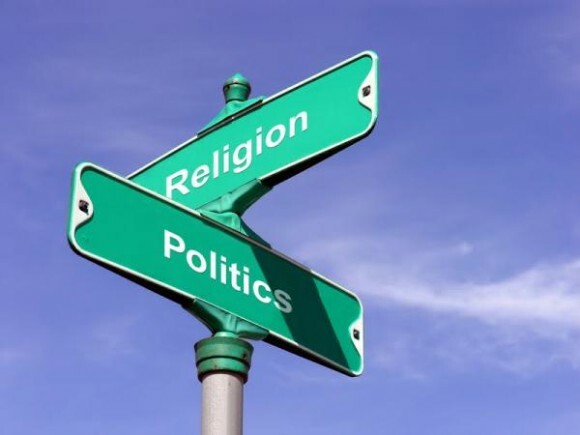 Nonetheless, it is causing quite a stir in the interfaith dialogue community whose primary investment it seems is portraying religion as innocent. The video in question – “The Rise of Al Qaeda” – is less than seven minutes long and is narrated by NBC new anchor, Brian Williams. The video was recently vetted by several self-appointed and evidently government approved interfaith careerists who find the video wanting. The reason: language that seems to equate the World Trade tragedy with Islam. 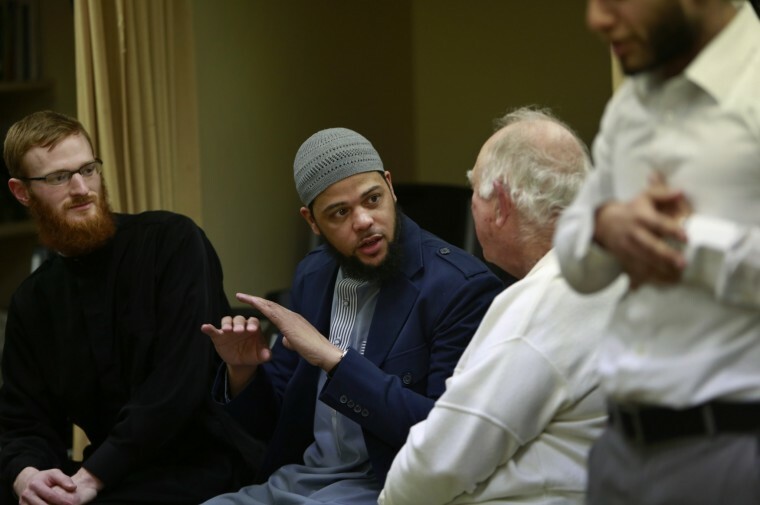 The bearded young Muslims scrolled through their iPhones and shared teachings of their prophet while older Christian men and women flipped through old-fashioned notebooks and talked about Jesus. They gathered each Tuesday for two months, these emissaries of faith exploring their differences and similarities in surprising ways. Things started tentatively. Most of those from Church of the Holy Family and Church of the Holy Apostles are in their 60s and had never known a Muslim, let alone sat in a mosque to discuss Muhammed and gospels and Sharia law. And the Muslims had been stung by what they called unfair portrayals of their faith, including a campaign launched last year against their plan for a mosque in Virginia Beach. But with each passing week, the meetings of East and West evolved from a polite curiosity – “Don’t wear socks with any holes in them,” one woman reminded others before the first visit to Crescent Community Center – into teaching and friendship. The group soon ventured into touchier subjects. Lon Scofield, 67, who calls himself “just to the right of Rush Limbaugh,” had trouble reconciling terrorism by radical Muslim groups with the kind, thoughtful men he met and grew to respect. The Muslims told the group they must separate the acts of radical men perverting religion from the truth of the Quran and Islam. Scofield agreed in principle but said that didn’t go far enough. To honor their Christian friends at Easter – a celebration of renewal – Muslim leaders in Sacramento will deliver 300 gifts at noon today to the First Covenant Church in Rancho Cordova. First Covenant made some history of its own in 2012 and 2013, when about 60 congregants served iftar dinners for hundreds of Muslims during the month of Ramadan, Shetler said. Throughout Ramadan, Muslims fast from dawn to dusk, breaking the fast with an iftar meal after sundown. 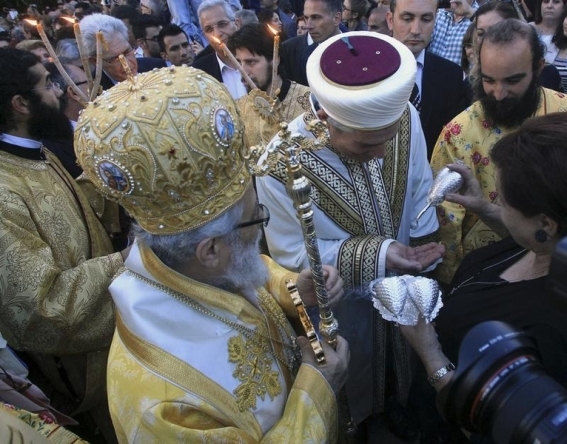 FAMAGUSTA, Cyprus – An unexpected moment during the Good Friday service in a long-abandoned church in Cyprus’ breakaway north illustrated how religion is helping to bring together Christian Greek Cypriots and Muslim Turkish Cypriots on this ethnically divided island. Rapturous applause greeted the announcement by Inatci, who helped make possible the first Holy Week service at the 14th-century church in nearly 60 years. Among the hundreds of faithful there was Mikis Lakatamitis, who was baptized at the church eight decades ago. Tears welled up in his eyes as worshippers lined up nearby to kiss an embroidered cloth depicting Christ’s preparation for burial. “I want to live in this moment because I don’t know if I’ll relive it again,” said Lakatamitis, whose family abandoned their nearby home at the start of ethnic strife in the late 1950s. Cyprus was divided along ethnic lines in 1974 into a Greek Cypriot south and Turkish Cypriot north after Turkey invaded following a coup aiming to unite the island with Greece. 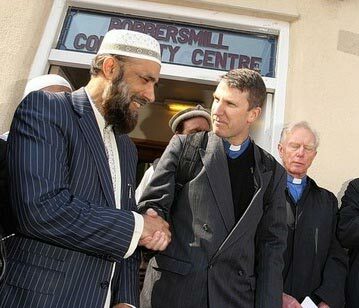 For decades, there was no contact between the religious leaders of the two communities. In the north, about 500 churches and monasteries — many hundreds of years old — were left to ruin, looted or converted for other uses. In the south, only eight of about 110 mosques still operate. But that changed in 2009 with a kind of faith-based diplomacy that has quietly been conducted between the leader of the island’s Greek Orthodox Christian Church Archbishop Chrysostomos II and Turkish Cypriot Muslim Grand Mufti Talip Atalay. (RNS) Law enforcement officers in Virginia will no longer receive credit for a counter terrorism course taught by a former FBI agent and anti-Muslim activist after the academy where the course was taught canceled its accreditation the day it was scheduled to begin. Nevertheless, the three-day course with John Guandolo, which Culpeper County Sheriff Scott Jenkins vigorously defended, proceeded at nearby Germanna Community College late last month. Some 50 people, many from out of state, reportedly enrolled in the seminar, “Understanding and Investigating Jihadi Networks in America,” advertised as $225 per trainee. The Culpeper controversy is the latest law-enforcement training course to draw harsh criticism from Muslim groups who say agencies hire purported experts in Islam or counterterrorism who in fact have other agendas. 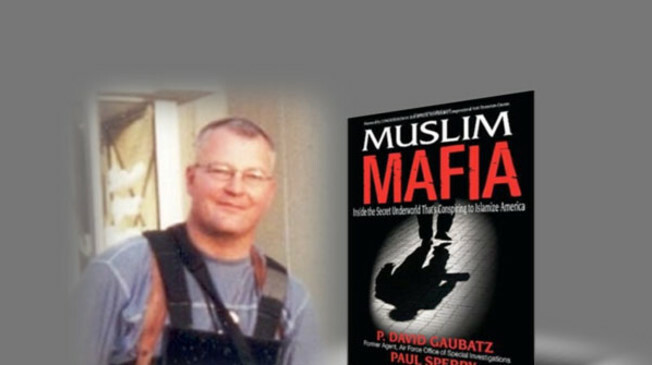 While Muslim-American activists and media reports have raised awareness about anti-Muslim trainers, occasionally resulting in curriculum reviews and canceled classes, many say the problem persists because there are too few police administrators to properly vet courses and instructors. The consequences, critics add, go beyond political incorrectness and include undermining public safety and obscuring real dangers as police officers chase bad leads based on profiling. 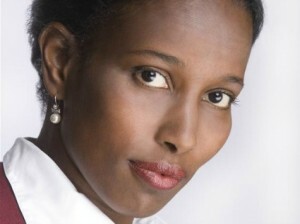 The news that Brandeis University cancelled the honorary degree it was planning to give Ayaan Hirsi Ali has raised a storm of controversy. On one side wereMuslims applauding the move as an apt recognition that Ali’s narrative was, if not Islamophobic in itself, fodder for the cannons of the rabid Islamophobic right. On the other were those protesting that the withdrawal represented a betrayal of freedom of speech and a cowardly retreat in face of the howling of religious zealots. Personally, I think Brandeis should never have thought about awarding Ali with an honorary degree. Not because she is Islamophobic but because her “scholarship” is at best weak, and at worst fraudulent. Ali left Denmark amid huge controversy because she lied about her name, her birthdate, the circumstances in which she left her home country, and her family history, including the fact that she was fleeing an arranged marriage . That alone calls into question her personal testimony about her life and the nature of the Muslim society she grew up in. More importantly, reading Ali’s description of life in Muslim countries and of Islamic theology, it becomes immediately clear that she paints circumstances with an overly broad, overly polemical brush. For instance, she says things like, “The veil is to show that women are responsible for the sexual self-control of men.” If you’ve read the Qur’an, you know that the Qur’an doesn’t ever directly tell women to cover their heads, and it certainly doesn’t tell men that they have free reign if a woman isn’t wearing a scarf. It does tell both men and women to be modest, and admonishes them against sexual relations outside of marriage, and to treat one another with respect, asallies in the quest to live a moral life.